In December 2005 I came the closest I’ve ever come to owning a jewel-encrusted dagger. This happened during a game of White Elephant, convincing me forever of that game’s potential for good. More recently, I’ve become convinced of the game’s power for a specific type of good: the acquisition of a language. I like it all the more because it simultaneously performs another type of good: me not having to work very hard. Though it’s most commonly played in winter, a version of White Elephant (a.k.a. Yankee Swap, as I learned this week) makes a high-interest, high-efficiency, low-prep activity any time of year, and you might find it especially useful near the beginning of the school year. Have a bag, bin, or pile of stuffed animals ready. That’s it. [to the student] What animal did you take? What animal do you have? Do you like ferrets [or whatever type of animal it is]? Do you have a real ferret at home? Do you like it? What is it like? Do you wish you had one? Why? Do you have a different type of animal at home? [to the class] What animal does she have? What color is it? Who (else) has a ferret at home? Who wants one? Ask further follow-up questions, keep probing, Circle, etc. This can already be pretty fun, but it gets better. Invite another student to get up and take a stuffed animal. But this student may either take an animal from the bin OR steal the animal the first person took, guaranteeing juicy drama. Again, ask questions of the individual animal-holders as well as the class, compare what the animal-holding students have and want, and so on. If there has been a steal, play up the drama, ask the victim how she feels about it, ask the class if it was mean of person 2 to steal, and whatever else seems interesting. If there was no steal, talk about what a nice person the student is, ask person 1 what she would have done if person 2 had stolen her ferret, how glad she is that this did not happen, and so on. Continue playing in the same manner for as long as it’s interesting enough–ideally, until everyone has an animal. (Students whose animals have been stolen can pick a new one immediately or after all other students have picked. Sometimes it’s necessary to implement a 2-steal limit, i.e., any given animal can be stolen only twice; after that, it is ‘safe’ with whatever person last stole it.) Feel free to have students recap what happened and what information was discovered, with you or with each other, orally or in writing, or not at all. 1. It’s easy to limit the total language involved. Other than the names of animals, which are often pretty fun, all the language can be really high frequency language. 3. It’s a good way to get to know students better. Not just regarding their animals: Let’s say you find out that Laszlo doesn’t have a pet and doesn’t really want one. Well, what does he want? Why would it be nice to have that? Or, let’s say he has a Huskie. What does he like to do with it? For what things that he likes to do would he take the Huskie along? For what things that he likes to do would he leave the Huskie behind? 5. It’s easy to turn the conversation into a classic quest via storyasking (see below). 1. Use some other type of item than animals–trinkets, books, clothing, instruments, equipment. Science, theater, and athletic departments often have old stuff they’re willing to part with. The Dollar Store has stuff it’s willing to part with for a dollar. You’ll have to decide how much low-frequency vocab you want to admit. 2.a. Have students brings items to use. 2.b. Do an actual White Elephant gift exchange for which students bring wrapped gifts. 3. Use the activity to find out something that a particular student doesn’t have, but really wants, and ask a story to help her or him get it. 4. Put the items in a container that players can’t see inside (such as a big garbage bag or canvas bag). This creates a different type of suspense and allows you to interview students about what they hope to pull out of the bag and why. 6. In a large class, for which playing the normal way may be unwieldy, you can establish an inner circle and an outer circle. Only the inner circle has animal-picking-or-stealing participants, but the outer circle also answers any questions you ask about what is happening or about the students (including themselves). Members of the outer circle can play next, or some other time. 7. 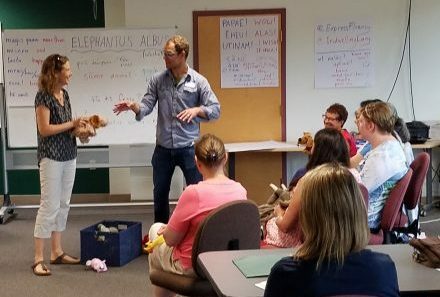 If there are multiple similar items, e.g., three different stuffed dogs, you can compare not only students, but also the dogs, discuss why different students like different dogs more or less, etc. 8. You can fake-interrogate the animals to see which owner they prefer. Posted in Lesson Plans, Teaching and tagged comprehensible input, joy, lesson plans, low prep, school, teaching, whatever works. We wish you had been there, too! I hope you did/do get to play with Alina, in any language! Thanks, Jeremy. One could do worse than concur with Martina! If you try this, let us know how you do it and how it goes. ?Como Es? In this activity, Mu students had to describe the action figure’s appearance, personality and what the action figure liked and disliked doing. Now that I am getting more comfortable using TPRS in my classroom I can take it to the next level. Wow, Lisa, that sounds like a lot of fun! Action figures would make for a really cool variation on White Elephant. Great! Thanks for reading and sharing, Lorena! Love the variations and extensions you list at the end! I play it with my 4th graders the day before Winter Break, as we work with “I want”, “is nice”, and “gives”. We even have printed pictures of cars, a TV, etc and a few “unpopular” items, which actually becomes quite popular. Thanks for sharing! Thank you for that description, Lisa. I knew there must be other people doing something like this! I love the idea of using pictures. JSB… this is GREATNESS! Thanks for sharing. I look forward to doing a version of this with my middle schoolers in the near future! “Elephantus Albus” will be immediately implemented in my Latin classroom. Thanks for all of the variations and extensions! Gratias! This looks like so much fun!! I bet my 2nd and 3rd graders will eat it up. I think I’ll play the first few days of school, can’t wait. This is great! I’ve had fun with small children with just a basket full of stuffed animals and other things I threw in, but never thought to make it into a game like this. Thank you. I love this idea! Kind of reminds me of the magic of Mafia in the CI classroom that I’ve read about extensively but which I’m still kind of afraid to implement it bc I’ve never played it is seen it played in person! This, I can do! Thanks! This is awesome! Trying it this week. Wonderful blog! No idea how I missed this earlier… but this is perfect for this week (we have 2 days with the kiddos). Cool! Have fun with it! Let us know if you notice helpful variations/adjustments. Sounds like a great plan, Jodi! Have fun, and let us know how it goes. I read this non-targeted game idea one day last week and tried it the next, in 2nd grade Spanish. We had just finished processing their artwork on the doc camera – Map of my Heart – from Valentine’s Day – with their little drawings of a few favorite things (in categories), including foods. In a circle at the rug, I had some hi- and low interest (Spanish cognate) plastic foods – pizza, cauliflower, yogurt, asparagus, cake….They LOVED relieving their classmates of the foods! Every 3 passes or so, we reviewed who had what. The kids were highly engaged and following the action for the remainder of class (prolly 20 min?) I used verbs like: has, wants, likes, prefers, passes, gives, & takes. They were definitely in the ‘flow’ – unaware that we were using Spanish to track the passing of the fake foods. What a simple and elegant context to wrap around this foundational/survival language. Gonna use this the first week of school, I think!!! BTW I named your wonderful game, “Cosa en la Bolsa” (“Thing in the Bag”) for my Spanish class.